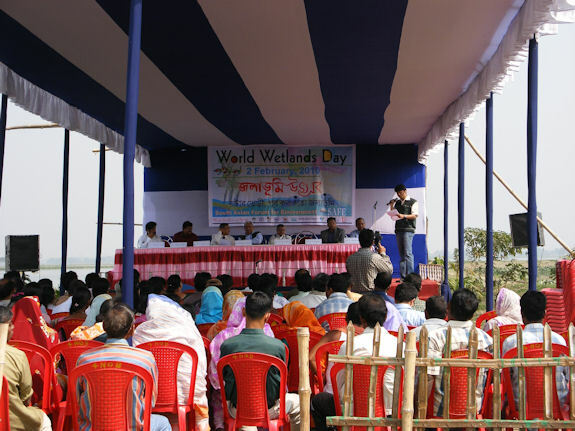 Celebrating with multiple stakeholders, the day marked in forming a joint collaboration with Nabard, various government agencies and communities to work together on managing resources of East Kolkata Wetlands, (EKW) a threatened Ramsar site of West Bengal. SAFE launched its première publication “GREEN Interpreters”, which is a Global Review for Environmental and Economic Negotiations in developing south. Ramsar's Lew Young, Senior Advisor (Asia-Oceania), could not attend the wetlands day program but sent a congratulatory letter message appreciating SAFE endeavors in raising awareness of the EKW and promoting its conservation and wise use. The event graced by, Dr.Biswajiban Majumdar, Chairman, Bidhannagar Municipality, (BM), Mr.P.Mohaniah, Chief General Manager, NABARD, Dr.R.P Bannerjee, EIILM institute, Dr.B.C Jha, Head, Reservoir & wetland fisheries division, CIFRI, Dr. S.P Gonchoudhuri, Managing Director, West Bengal Green Energy Development Corporation Limited, Mrs. Ila Nandi, Vice Chairman, BM, the event was presided by Mr.Ramesh Bar, President, Fishermen cooperatives, and convened by Dr.Dipayan Dey, Chair, SAFE. Over 400 fishermen and women celebrated the day, with environmentalists and other stakeholders, the traditional chou dance kept them all enthralled. Lunch served four types of fishes, of EKW which were cooked in mustard sauce and coconut milk. We thank our partners, Kolkata Port Trust, Legal Options, Waterlife, Banglanatak.com and Natar Bheri Fishermen Cooperatives, and media. SAFE aspired to make this day as an eye opener to all stakeholders of East Kolkata Wetlands, so that its immense significance in biodiversity richness and climate change are highlighted and awareness builds up in them. Today’s East Kolkata Wetlands are vanishing at an alarming rate of 1% per year and is being severely threatened by urban encroachment. This year too, SAFE received an enormous community response that called on combating the challenge of climate change by saving the precious Ramsar site. 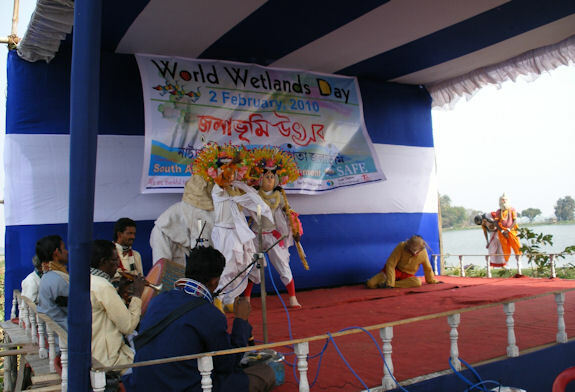 The event took place in Natar Bheri Fishermen’s cooperative at East kolkata Wetlands, where the ecotorism hub and wetland awareness center has been installed by SAFE under the aegis of the first BIORIGHTS project of India. 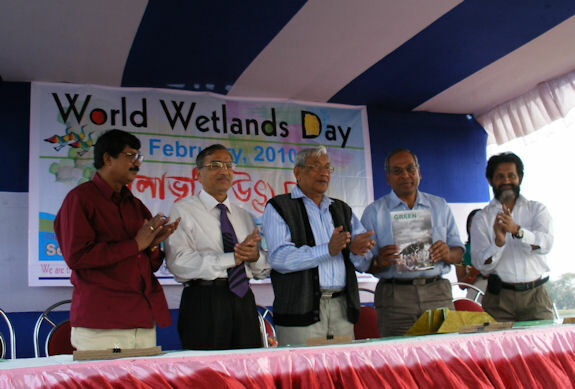 A number of green activists like Mr Ravi Menon, Dr Aroop Choudhury, Mr S B Mondal, who were present on the occasion and other dignitaries expressed their deep concerns about the encroachment and habitat loss in East Kolkata Wetlands. Dr Gonchoudhury emphasized on the role of wetlands in climate change mitigation and said that we must save these wetlands to compensate our city’s emission footprints. In appreciation of SAFE’s endeavor to augment the livelihood of its poor community, he mentioned solar electrification in the area to be installed soon to facilitate the community. Mr P Mohanaiah greatly appreciated SAFE’s work and extended all support from NABARD through bank credit linkage and financial inclusion of the poor fishermen community in the area. On behalf of the Director CIFRI, Dr Jha, a senior scientist from CIFRI said that his institution would extend all research and training support in capacity building activities in partnership with SAFE for the fishermen in order to preserve the biodiversity of the wetlands. People’s representatives from different fishermen’s cooperative namely Gompota, Paresher Bheri, Chhoinavi, Char Namber bheri, Chaker Bheri and Natar Bheri expressed their thanks to SAFE and mentioned deepest concerns about the ecological health of the wetlands. They highlighted the encroachment problems, heavy siltation due to urban activities and irregular distribution of sewer which is greatly damaging the biodiversity and livelihood of people there. 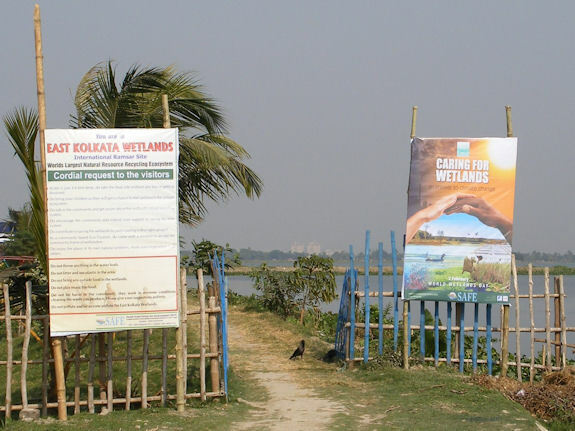 The celebration hosted stalls and displays for awareness from NABARD and CIFRI, and SAFE showcased its ongoing project on Conservation of Endemic Fishes at East Kolkata Wetlands. One stall was laid by the fisherwomen Self Help Groups for serving delicacies of local grown fishes to the guests, which was a point of attraction for the crowd. Banglanatak.com, an event partner of SAFE arranged a folk dance show called CHHOU with the aboriginal folk artistes from Purulia. Their vibrant and colorful presentation added a great valor to the theme of event and glued the community eye to the center stage. In this occasion SAFE released its première publication “GREEN Interpreters”, which is a Global Review for Environmental and Economic Negotiations in global south. The programme ended with a lunch which served local fish varieties cultivated at EKW, and all dignitaries enjoyed the meal and encouraged the spirit of the community’s participation in the event.